The markets and my garden are overflowing with lush swiss chard. 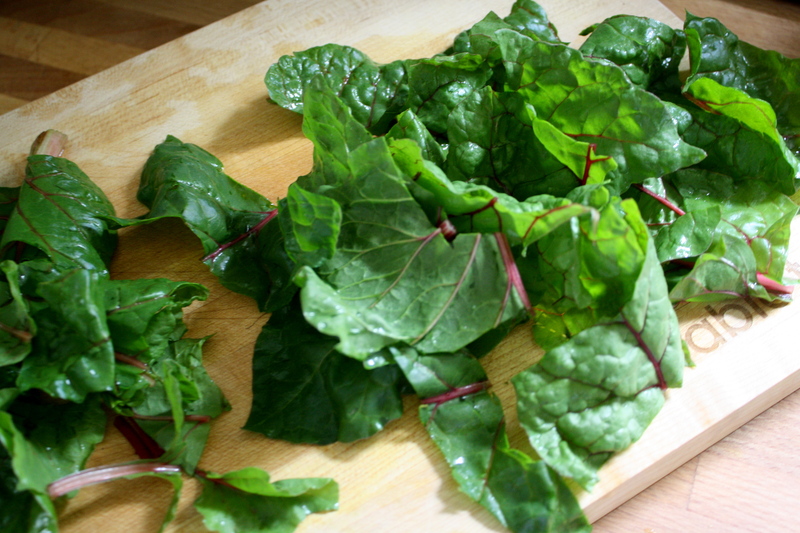 Chard is a great source of iron, folate, zinc, Vitamin A, Vitamin C, and Vitamin E…to name just a few. This powerhouse green should be on your plate as much as possible and it has been making an appearance in nearly all of my meals lately since I just harvested THREE huge bags of it. Want some? This week for the Food Matter’s Project, Laura of Chef Laura at Home chose Mark Bittman’s Bruschetta recipe. Bruschetta consists of roasted bread topped with good olive oil, rubbed with crushed garlic, salt and pepper, and then topped with whatever your little hungry heart desires. Typically, the toppings consist of either a tomato basil salad, or white beans, or cured meats, or cheese, or in my case…sautéed CHARD and an egg. My pictures show a fried egg, but I also tried this dish with a fabulous poached egg (my first attempt at poaching eggs and damn it was easier than I thought). 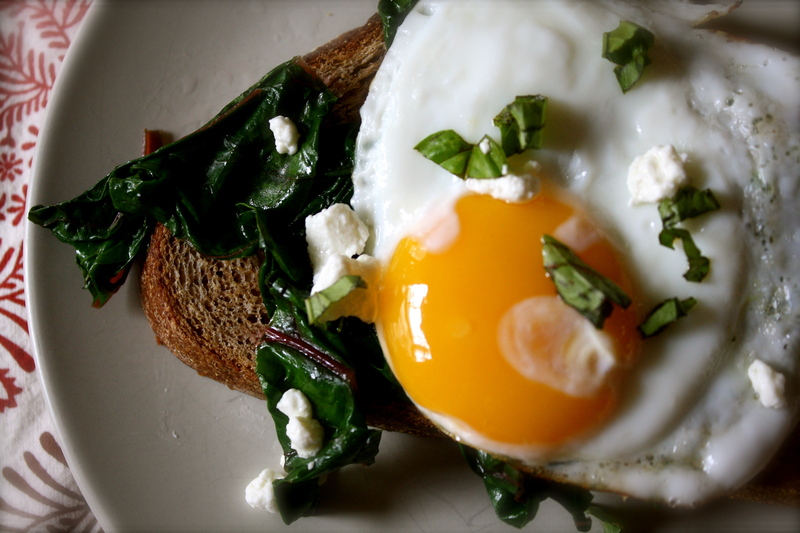 The secret to poached eggs is buying good fresh eggs. To make bruschetta, drizzle a slice of good rustic whole grain bread with good olive oil (because you deserve the best). Toast the bread under a broiler for a few minutes. When the bread is done, rub one or both sides with a clove of mashed garlic. Now you are ready to top it to your liking. To see what some of the other FMP bloggers chose to top their bruschetta with, go here. Heat broiler on high. Drizzle bread with olive oil (1 teaspoon per slice of bread). Place bread on cookie sheet on the top rack of the oven just beneath the broiler. Depending on the thickness and size of your bread, broil for 1 to 3 minutes per side. Keep an eye on them because the edges will brown quickly and you will be eating croutons for breakfast instead of toasted bread. Remove from oven and rub a clove of garlic on one or both sides of the warm toasted bread. 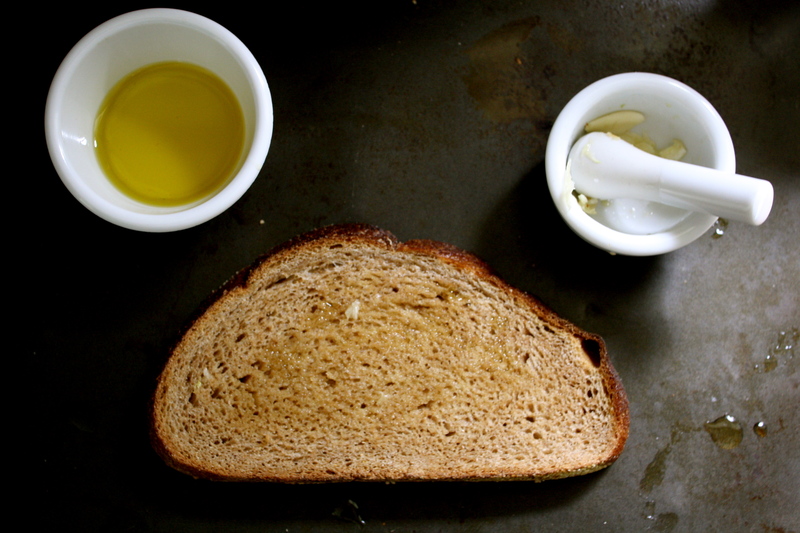 While toasting the bread, heat the remaining teaspoon of olive oil in a sauté pan over medium heat. Place chard in pan and sauté for 3 to 5 minutes, until chard is wilted. Drizzle with lemon juice. Season with salt and pepper. Cook the eggs to your liking. Go here for a step by step tutorial on making the perfect poached eggs. So easy and good. Place toasted bread on plate. 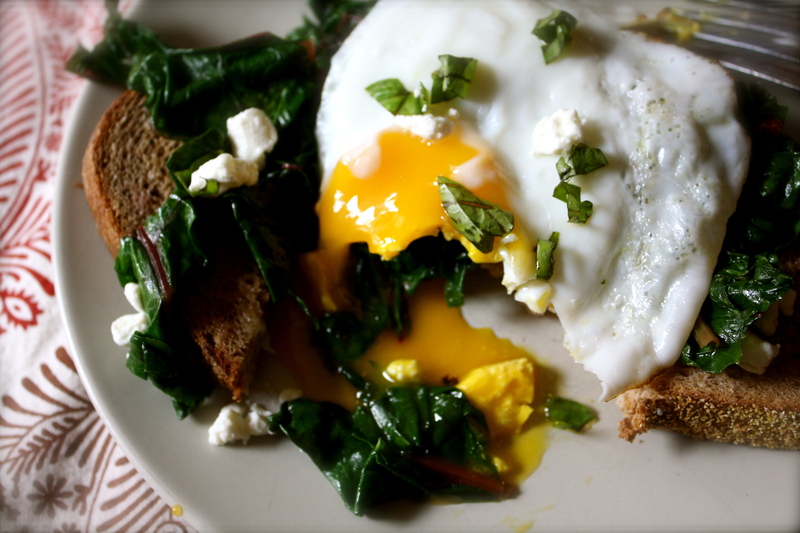 Top with sautéed chard and poached egg. Season with salt and pepper. I topped mine with fresh slivered basil and goat cheese also. Mmmm. Love this breakfast bruschetta! I haven’t had breakfast yet and now I think I know exactly what I want! haha…I had to go to the store this morning to get eggs so that I could have it for breakfast again. This looks like a perfect breakfast to me – perfect balance of rich and fresh. Thanks! Beautiful and yummy, as usual! I want to eat your blog! I do this sort of thing with kale all the time. Perfect for breakfast, lunch or dinner! That looks like my ideal lunch: quick, tasty and yummy! This reminds me of an appetizer I just had in a great farm to table restaurant: toasted raisin walnut bread, caramelized onions, asparagus and a poached egg. Holy delicious. Really amazing. I need to start getting creative with toast! Oh man that sounds awesome! A fried egg tastes delicious on everything! I like the use of kale- and the picture looks so appetizing and delicious! This looks so good, Alissa! Love the changes you’ve made to your site, too. I had so much fun with you and Kiley this weekend! Oh thanks! I had a great time too. Glad you came out with us to the show! And that will be breakfast tomorrow! Oh I’m so glad! I love this breakfast.